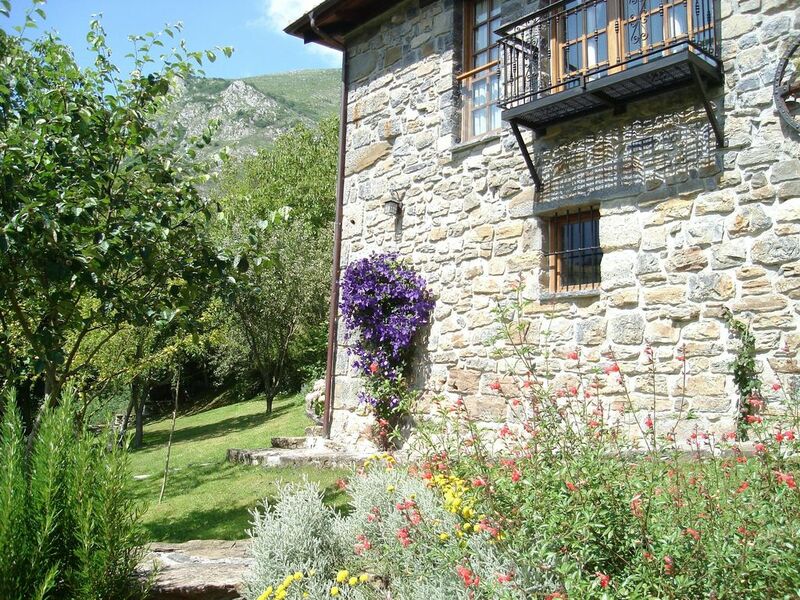 The Rincón de Mon is a rural accommodation situated in the heart of the Ponga Nature Reserve, between the Nature Reserves of Redes and the Picos de Europa National Park. The stables and barn, built in 1936, have been renovated preserving all the original features of a primitive construction, made of limestone, wood and Moorish tiles, which are typical of the local Council (50 cm thick walls, beams that were cut using an axe, and which were drawn by oxen for several days to the building. The accommodation sleeps three people, with a possibility of two more places, given that it has a double room with a large wardrobe, a single room, also with a wardrobe, along with a lounge-dining room with a fold up double sofa bed, and a bathroom. There is also the possibility of a cot. We stayed one week and had a lovely time. Our hosts Carlos and Andrea were wonderful. We drove from Madrid and arrived after midnight. Carlos was waiting for us so we don't miss the house. The next day he gave us maps and recommended hiking trail and other activities in the area. He also presented us with local home-made sweet. On the last day, Carlos advised us on which road to take as there was some tournament. Andrea, who knew very good English, helped us with directions and suggestions for activities in the area by email before we arrived in Spain. She also helped us while driving from Madrid. We came from the South through Riano which is a very winding road where you have to drive slowly. A practical advise, if possible, drive to the house from the north (from Canagas de Onis). The house is a lovely renovated stone house. It has a very nice backyard, with fruit trees and a BBQ that uses wood (wood is provided). The area is excellent for activities such as canoeing, quad and hiking. Covadonga lakes is one of the main attractions in the area and highly recommended. Cangas de Onis is 30 minutes drive. It is a nice town with cafes and restaurants and you can book activities there. In Cangas, there is also a large supermarket for groceries and fresh fish. A truck comes to the house daily except Sunday, where you can buy bread, milk and other basics. Thank you very much Carlos and Andrea for making our stay lovely and memorable. We (family with two kids 16-18) spent a great holiday week at El Rincon de Mon, thanks to the cozy and well equiped house, the lovely garden, the beautiful views from the terrace, the stunning scenery of Ponga natural parc, the warm welcome and all the kind sugestions that the owners have sent us both before and during our stay. The living room is a bit small for 4 grown-up people, but with the beautiful weather, we mostly lived outside. Although we planned to explore the picos, we stayed mostly in the Ponga area, as it offered enough to enjoy. The daily visit of the mobile shop gave us no need to make a regular trip to Cangas de Onis. We surely plan to return (next time maybe just the two of us). When you want to spend a relaxing holidays (just by doing nothing or by making long walks or enjoying the Austurian cuisine) in a quiet and beautiful environment and enjoy the luxary of a well equiped house (with excellent wifi in the house and the garden), we can recommend El Rincon the Mon! Estuvimos en el Rincón de Món la semana pasada y todo son buenas palabras... Empezando por los propietarios que te hacen sentir como en familia!!! explicándote con todo detalle la casa así como el entorno... Espectacular!!! A la casa no le falta de nada, limpísima y con todo lo necesario para pasar unos días muy cómodos. Las vistas desde la misma son una pasada, y que decir de la zona de barbacoa, todo un lujo del que hicimos uso con una buena carne de la zona. Estamos seguros de que volveremos ya que tanto los paisajes de Ponga como el trato de sus gentes nos enamoró!!! Un saludo muy grande para Carlos y Dolores!!! Nos llevamos un trozo de Ponga en el corazón!!! ¡¡Gracias, amigos, os llevamos en el corazón!! Hemos pasado una semana estupenda. La casa es muy acogedora y cómoda, está bien equipada y es perfecta para ir con niños. Aunque lo mejor es la tranquilidad, el silencio y por supuesto las vistas, tanto durante el día como para salir a ver la estrellas por la noche. El propietario, Carlos, es encantador, tenemos que agradecerle lo mucho que nos ha ayudado en todo lo que ha podido y nos ha aconsejado sobre visitas, restaurantes... La verdad que nos facilitó mucho la estancia y nos hizo sentir como en casa. No dudaremos en repetir en cuanto volvamos por la zona.